United Nations -- United Nations Secretary-General Ban Ki-moon congratulated Myanmar's Aung San Suu Kyi and her National League for Democracy party on Thursday for a "landmark performance" in the country's first free election in 25 years. Suu Kyi's party has won about 80 percent of the seats declared so far in the lower house, which puts her on course to form the new cabinet. 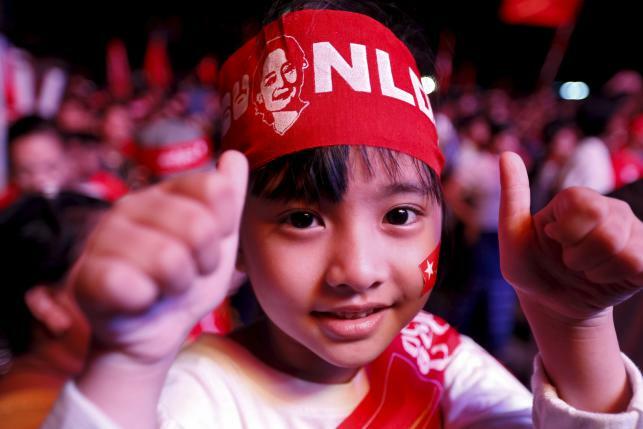 NLD is also well ahead in the upper house and regional assemblies. Ban also acknowledged the "the courage and vision" of Myanmar President Thein Sein, who ushered in sweeping democratic and economic reforms four years ago in the country, also known as Burma. "While saying this, he is regretfully aware that a large number of voters from minority communities, in particular the Rohingya, were denied the right to vote and some were disqualified as candidates," his spokesman Stephane Dujarric said in a statement. "There is much hard work that remains ahead on Myanmar's democratic journey and towards making future elections truly inclusive," he said. Myanmar's government has denied the Rohingya Muslims citizenship. Hundreds died in clashes between Rohingya and ethnic Rakhine Buddhists in 2012. Some 140,000 Rohingya live in squalid camps, while thousands more have fled by boat, leading to a regional migration crisis. Nobel peace laureate Suu Kyi won the last free vote in 1990, but the military ignored the result. She spent most of the next 20 years under house arrest before her release in 2010. She is barred from taking the presidency herself under a constitution written by the junta to preserve its power. "The Army's support to the conduct of credible and transparent elections, as well as its acceptance of the results, have also been uniquely important," Dujarric said. "As Myanmar begins the process of forming its next government, the Secretary-General urges all national stakeholders to maintain a calm atmosphere and uphold human rights and the rule of law," he said.